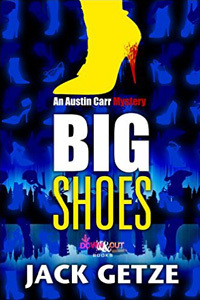 Big Shoes is available in trade paperback and ebook formats. Former Los Angeles Times reporter Jack Getze is Fiction Editor for Anthony nominated Spinetingler Magazine. Through the Los Angeles Times/Washington Post News Syndicate, his news and feature stories have been published in over five-hundred newspapers and periodicals worldwide. He’s currently writing the next Austin Carr screwball mystery. His short stories have appeared in A Twist of Noir and Beat to a Pulp. He is an Active Member of Mystery Writers of America’s New York Chapter. He regularly blogs at Austin Carr’s Crime Diary.